The Book of Kells is one of the rarest books in the world and is surrounded by some mystery; and, like Hadrian’s Wall, millions of words have been written about it. The following You Tube link(s) are available to those of you who want the story. 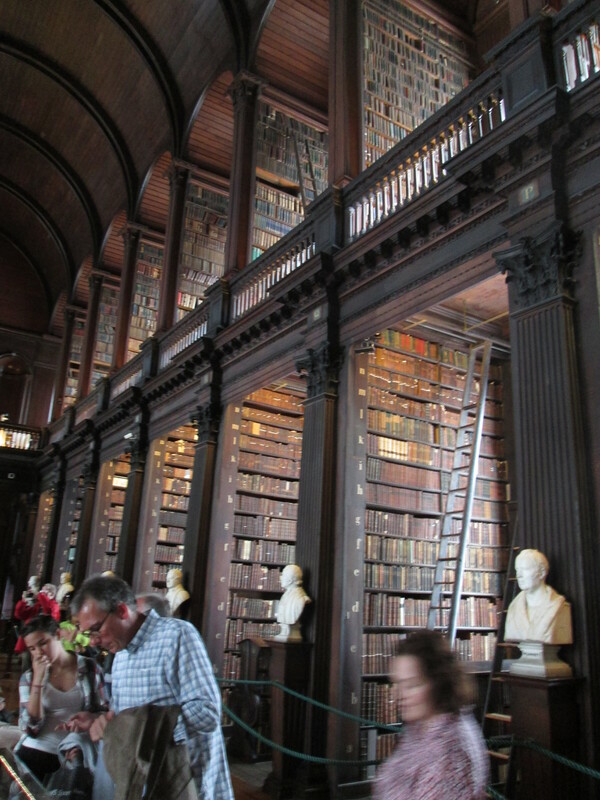 You Tube, Book of Kells, There are 7 parts. When you go to Part 1, you will be able to continue through the other 6, or not, as you choose. 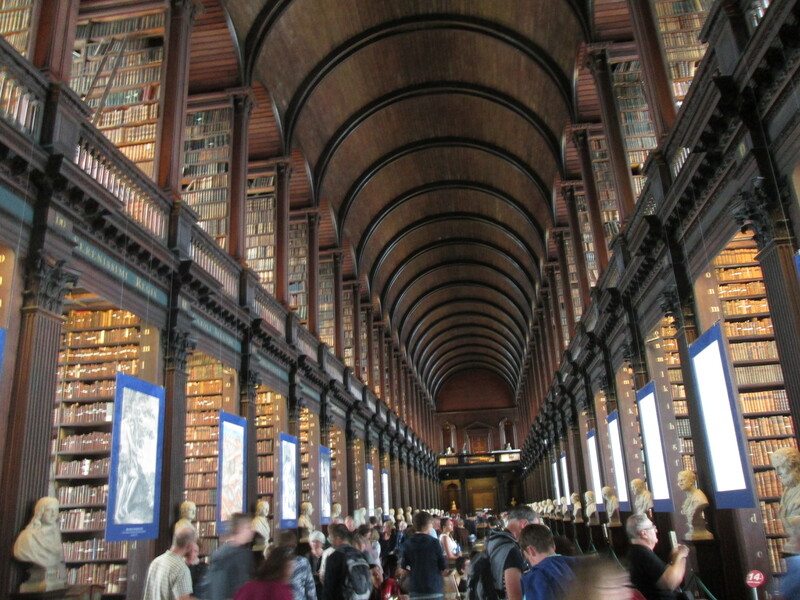 In this library there is one copy of every book ever published in Ireland. The Long Room: The main chamber of the Old Library at Trinity University, is the Long Room, and at nearly 65 meters in length, it is filled with 200,000 of the Library’s oldest books. When built (between 1712 and 1732) it had a flat plaster ceiling and shelving for books was on the lower level only, with an open gallery. By the 1850’s these shelves had become completely full; largely as since 1801 the Library had been given the right to claim a free copy of every book published in Britain and Ireland. In 1860 the roof was raised to allow construction of the present barrel-vaulted ceiling and upper gallery bookcases. Marble busts line the Long Room, a collection that began in 1743 when 14 busts were commissioned from sculptor Peter Scheemakers. The busts are of the great philosophers and writers of the western world and also of men connected with Trinity College – famous and not so famous. The finest bust in the collection is of the writer Jonathan Swift by Louis Francois Roubiliac. Other treasures in the Long Room include one of the few remaining copies of the 1916 Proclamation of the Irish Republic which was read outside the General Post Office on 24 April 1916 by Patrick Pearse at the start of the Easter Rising. The harp is the oldest of its kind in Ireland and probably dates from the 15th century. It is made of oak and willow with 29 brass strings. It is the model for the emblem of Ireland. Just pull up a chair and a reading lamp and start. Sorry to say all of these books are definitely off limits to the general public. No soft leather chairs here. No reading lamps; nothing to encourage you to sit, sip coffee and go to far away places in your mind. Ha’penny bridge, over the River Liffey. 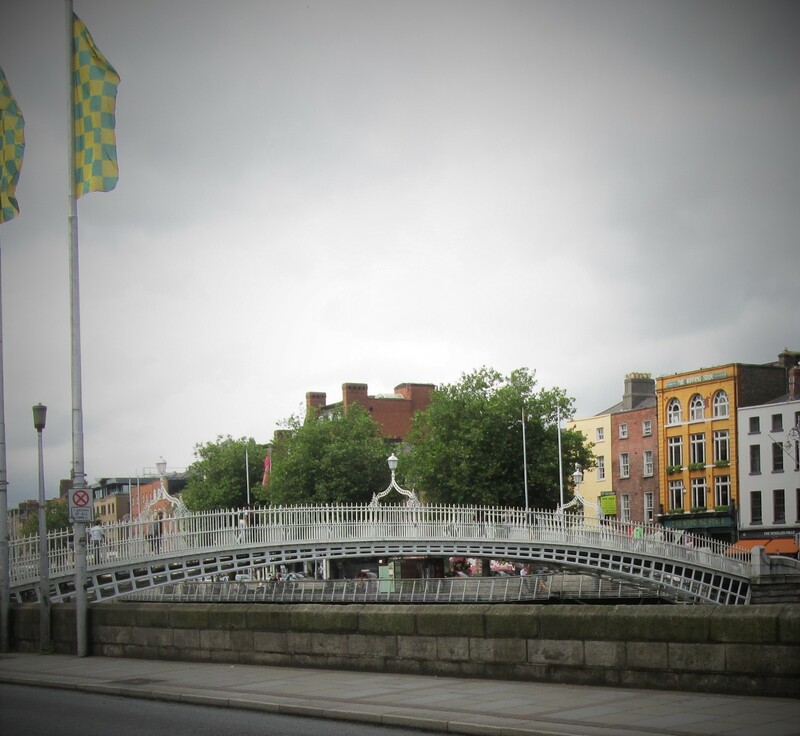 The Ha’penny Bridge is the best known of Dublin’s bridges. It was built in 1816 and was the first iron bridge in Ireland. It is a single span structure with cast iron railings and decorative lamps. It was originally named the Liffey Bridge but is now called the Ha’penny because until 1919 to cross it there was a half-penny charge. Before the Ha’penny Bridge was built there were seven ferries, operated by a William Walsh, across the Liffey. The ferries were in a bad condition and Walsh was informed that he had to either fix them or build a bridge. Walsh chose the latter option and was granted the right to extract a ha’penny toll from anyone crossing it for 100 years. The toll was increased for a time to a Penny Ha’penny (one and a half pence), but was eventually dropped in 1919. While the toll was in operation, there were turnstiles at either end the bridge. I was told that at one point 2 men who wanted to cross the bridge asked the keeper at the turnstile if there was an extra charge for baggage. When told no, one man jumped on the back of the other and both crossed the bridge for a ha’penny. 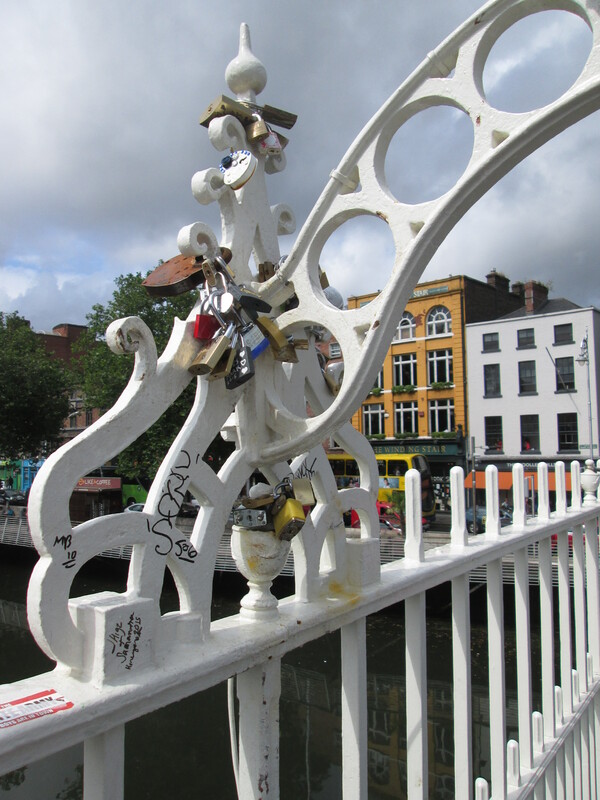 Today in Dublin there is concern over the “Locks of Love” which are locks placed on the bridge by lovers. The city has started to remove the locks because the extra weight causes damage to the structure. The same problems are apparent in Paris on the Pont des Artes and in Venice on the Ponte dell’Accademia. Go to link below for multiple photos of locks of love on bridges. Butlers Chocolate Cafe ..Heavenly, nothing else to say! I had already eaten the piece of double double chocolate, before I took the shot. 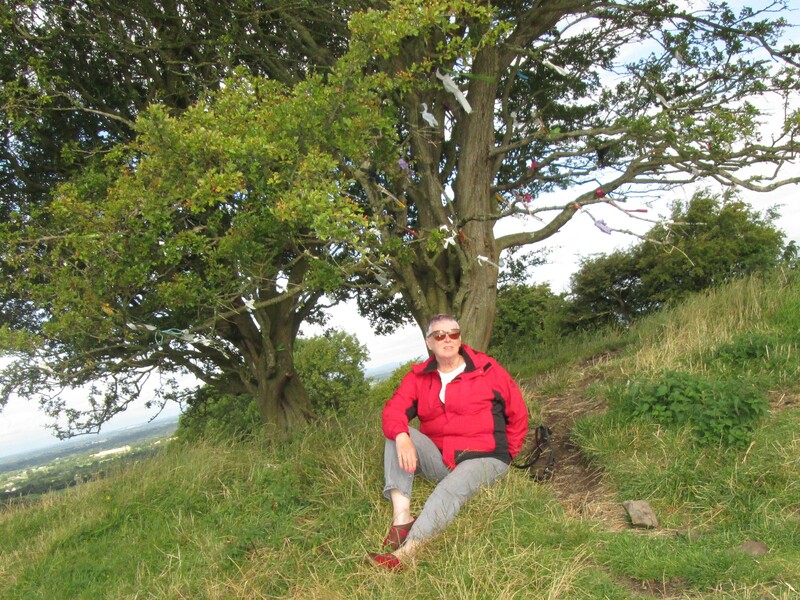 Celtic Circle Tour: If, like me, you are interested in history, you would have enjoyed walking among the neolithic sites and old castles in the Boyne Valley, north of Dublin. 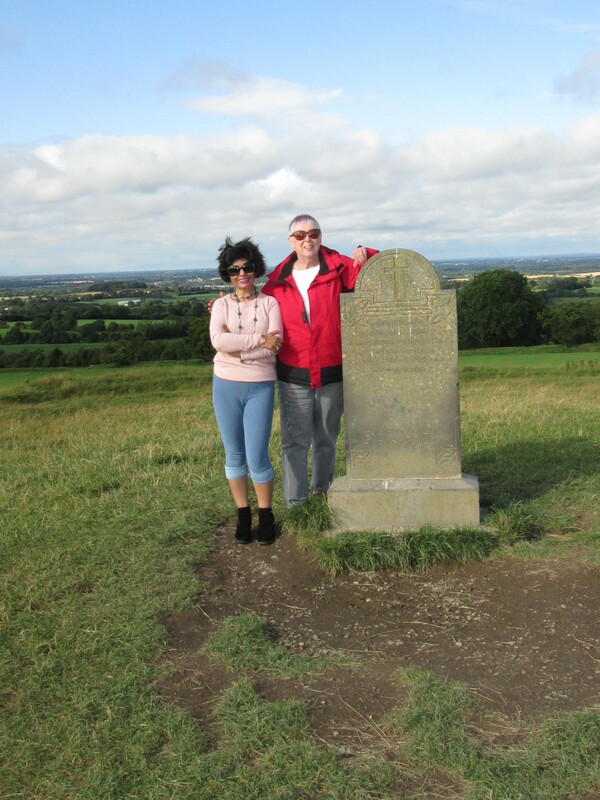 The Hill of Tara was the highlight for me, only because in the 11th century The Book of Invasions noted it as the seat of the high-kings of Ireland; (and my ancestors came from Ireland). Written records show that high kings were inaugurated there, and the “Seanchas Mor” legal text (written some time after 600AD) specified that the king must drink ale and symbolically marry the goddess Maeve (Medb) in order to qualify for high kingship. 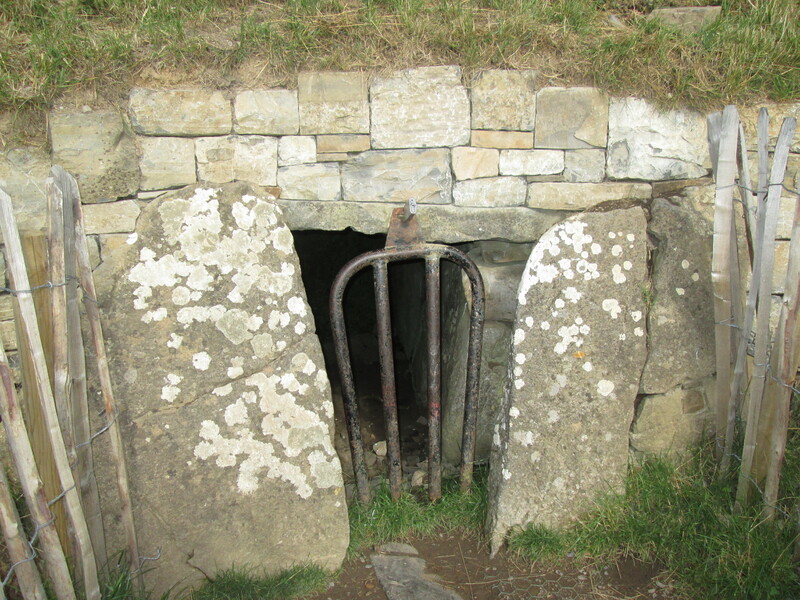 Disputes over Tara’s initial importance increased when 20th-century archaeologists identified pre-Iron Age monuments from the Neolithic period (roughly 5,000 years ago). One of these forms, the Mound of the Hostages, has a short passage aligned with sunrise on the solar cross-quarter-days coinciding with ancient annual Celtic festivals celebrated on the midpoints between vernal and autumnal equinox and summer and winter solstice. There have, in the past decade, been archaeologists/scientists who have used ground penetrating radar to look under the mounds and were quite surprised at the depth and circumference of this area. For those of you who are not enamored with history, there is also a Fairy Tree where people write wishes and hang them on the tree with ribbons. It turned out to be a lovely day for the tour and I met a very nice woman from Canada, with a similar background to mine, working with adults with disabilities, who became my “traveling partner” for the day. 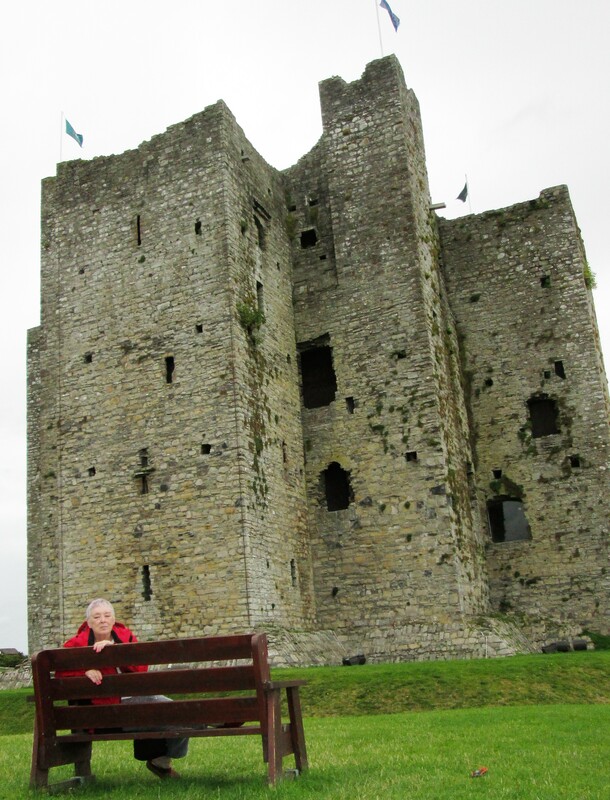 And, this is Trim Castle used as the backdrop for the movie Braveheart and it is also where my camera battery died. See you next time, with a fresh battery, on the Ring of Kerry, in southwestern Ireland. I love the idea of the “love locks” and “fairy tree”. Shame they couldn’t just put a structure near the bridges so people can still leave the locks without affecting the bridge itself. Yes, it is too bad there is not another solution to the Locks of Love.